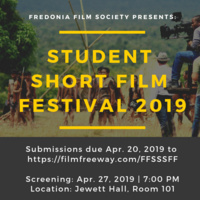 Fredonia Film Society has brought their film festival to a larger level this year! If you've created a short video (<15 mins) of any background, this festival is a perfect opportunity to have it showcased. We want to provide a platform for students to screen their work and win awards for their efforts, regardless of filmmaking background. Submission and attendance to the screening event is free. Refreshments will be available. Disclaimer: We ask your film does not contain explicit sexual, violent, or offensive content that is not artistic or functional to the film. And although submission is free, there is no guarantee each will be shown depending on amount received.